I earned a Ph.D. in New Testament from Emory University in 2011. Officially, my outside area (i.e., secondary specialty) is in Homiletics—the art of preaching. Practically, my research and writing focuses upon the intersection between Scripture and Liturgy. That intersection occurs within preaching, within lectionaries, within the liturgy’s appropriation of Scripture and in ascetical theology—the discipline where Scripture is interpreted through Christian living. My areas of interest include the Church Fathers (the theologians and writers of the first few Christian centuries), monasticism as it developed in the Christian West, the religious life of Anglo-Saxon England, the English Sarum Rite, medieval Books of Hours, and liturgical spirituality generally. These are some of my publications. The Saint Augustine’s Prayer Book published by Forward Movement is the latest revision of a venerable devotional supplement sponsored by the Episcopal monastic Order of the Holy Cross. Originally intended as a catholic supplement to the 1928 Book of Common Prayer, it had not received a fresh edition since the creation of the 1979 Book of Common Prayer. Working closely with Fr. David Cobb, we created a revision that retained the strengths of this classic work and fit it for use with the current prayer book. Reading Matthew with Monks: Liturgical Interpretation in Anglo-Saxon England is a revision of my doctoral dissertation for a broader audience published by Liturgical Press under Cistercian Publications. With a preface by my mentor, Luke Timothy Johnson, the book wrestles with the question of hermeneutics—the art and science of biblical interpretation. I explore biblical interpretation as it occurred within early medieval monastic communities given a particular voice by Ælfric of Eynsham, a 10th-century English Benedictine abbot and a leading light of the Benedictine Revival on the eve of the Norman Conquest. Working closely with his sermons, I demonstrate the way that biblical interpretation and sermon creation is part of the larger liturgical encounter with Scripture lived out in these monstic institutions. Putting Ælfric’s sermons on specific passages from Matthew in relation to modern biblical scholars helps readers appreciate the insights that Ælfric and his community bring to the text to help modern scholarship see interesting angles of interpretation and possibilities in the Scriptures obscured by modern approaches. 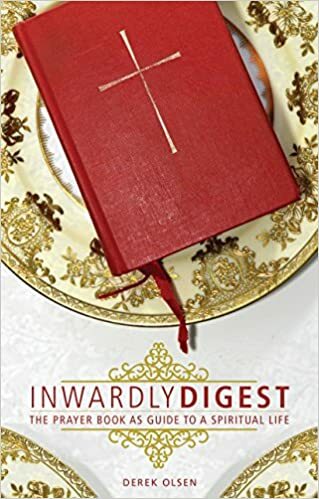 Published by Forward Movement, Inwardly Digest is my valentine to the Book of Common Prayer. Rather than exploring it from a purely historical perspective or treating it as part of a sequence of textual growth and development, I see it first and foremost as a source for liturgical spirituality. As a result, I start out with an explanation of what liturgical spirituality is, how it works, why it works, and the habits and disciplines that make the most of it. Once that is established, I look at the three foundational pieces of prayer book spirituality: the Calendar, the Daily Office, and the Eucharist. For each of these three pieces, I provide an initial chapter that orients you to what this component of the liturgy is trying to accomplish within the spiritual life. Frequently I do touch on the history of the practice to help make sense of it, but I’m not trying to trace the development of these things here. The next chapter will look at how the component actually, physically appears in the current Book of Common Prayer–where the various parts are found and what you need to do in order to fit them together properly. A final chapter dives at some depth into one particular aspect that I believe deserves special focus for its importance to the spiritual life. It’s accessible enough for people new to the church or even just curious about it, but includes material that life-long Episcopalians have likely never heard or discovered as well!